Many hours at a time, I have wondered about the purpose of the thousands of Iranian groups active in cities around the world. This is in reference to the numerous local television stations, Persian poetry and literature societies, political clubs, music venues and artists, and not to mention the countless professional and academic groups. As with other ethnic immigrants, the immediate aim of such activities would seem to be the preservation of one’s heritage in a foreign environment. However, with the advent of the Internet and satellite television in recent years, it is not surprising to find these cultural or political groups attempting bravely to reach beyond their local proximity while hoping to arrive at the Iranian heartland, ultimately. Now, recalling our previous discussion about representation or misrepresentation of contemporary Iranian society through media at large, it makes sense to consider the effective role of the recently mushrooming Iranian media outside the borders of Iran. That is, comparing what the media wants to achieve and what it is achieving. More specifically, let us examine the impression that the media makes on the target audience. I am not aware of any academic studies with respect to the effects of these media on its audience or its role in general. However, together with my observations and educated guesses I can assert with some certainty that the effects on the Iranian audience living in Iran are not as great as one might wish or even expect. These groups or gatherings seem to be merely a meeting point for Iranians abroad where they are essentially reminded of their cultural heritage. That in itself has a definite social value and should be fully supported, however, any hopes of having a direct affect on Iranians in Iran would be more or less futile. 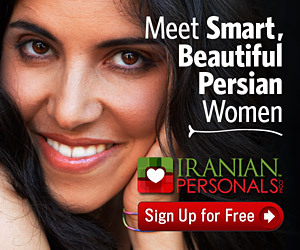 Consider Iranian.com for example. Firstly due to the language barrier the readership from Iran is minimal. Because of the regime’s closed-door policy Iranians are not exposed to foreigners, especially leisure tourists through whom, normally, natives would become familiar with an international or a foreign language. Therefore, mainly Persian language websites are accessed. One may argue that there are hundreds of professional and academic Iranian online forums that are not only bringing together the Iranian academia and experts for exchanging ideas but promoting mutual co-operation with their counterparts in Iran. Part of my counter-argument is explained next and the other part is that the number of such forums and resources are so miniscule in comparison to the needs of the country that their effects are scarcely felt by the general populace. Secondly, Internet is an active medium, in contrast to radio or television being passive media requiring very limited technical skills to operate. Because of this, E-magazines or any website in any language, other than Persian, will have a tough time competing for Iranian eyeballs, when compared to the more passive media such as satellite television. Meanwhile, of the roughly 20 Persian language television stations available via satellite in the Middle East, perhaps only one or two have managed to acquire a significant audience in Iran. One must admit though, that despite the poor picture quality and the bad taste in content, the non-political stations have maintained an undeniable following in Iran. I believe the most significant effect they have had is owed to their sponsorship and co-ordination of the various concert and entertainment events in the region. Such events have created an attractive reason for Iranians to explore and discover their neighbors in the Middle East like never before. These experiences have had a noticeable change in their view of the world around them. As compared to any other activity sponsored by any Iranian groups abroad I firmly contend that these entertainment events together with the prospering tourism industry in parts of the Middle East are having the most measurable effect on individual Iranians. Regardless of the popularity of any of these expatriate operated media and entertainment events, one of the underlying messages relayed through them reflects the glint of hope in the minds of many Iranians living abroad. The message, or more correctly the dream, is that someday in the foreseeable future, Iran will magically become the glorious Persia it once was and Iranians will return there and live happily ever after. Well, I hate to shatter people’s dreams but when my sense of realism dominates I feel obliged to make some drastic statements. As sad as it may be, once an Iranian leaves the immediate orbit of Iran, the chances of him/her returning and living as before in Iran are nominal. The further away they go and the longer they stay outside the chances of them returning permanently becomes increasingly less. With some caution I can claim that the only Iranians who may be tolerant of the system and be able to live there for an indefinite period are those ordinary residents that have never left Iran and have no choice but to accept the system as is. For this we must allow a shift in paradigm. If I may exaggerate a bit, Iranians generally seem to think that there is Iran, and then there is America and then there is nothing else. Perhaps if we drop the egotistical and tribal mentality and begin thinking not in terms of just Iran by itself but also take into account the region just outside of Iran, more commonly called the Middle East, then there may be some hope for implementing social, business, cultural and various other programs that would normally be impossible to realize in Iran and if implemented outside of the Middle East it would be out of reach of most Iranians. After all, “ancient Persia” was all of the Middle East and more. In Cyrus’s times you would have to embrace an Egyptian, an Iraqi, an Israeli, an Afghani, a Turk and many others, as your compatriots. Perhaps advocates of “ancient Persia” should pay less lip service to it and more attention to its implications. Not to sound patronizing but it is upsetting when I hear Iranians talk non-stop about their wonderful ancient king, who was responsible for uniting the various ethnic groups, supposedly in a just manner, while they hypocritically whisper slanderous and racist remarks when visiting any of their neighboring countries as tourists, including Turkey and the Persian Gulf states. Furthermore, many people blame the failures of the contemporary regimes in Iran on the vast ethnicity variation in Iran. I would tend to put the blame on the designers of the governments for not promoting a pluralistic society by way of giving sufficient voice to the various ethnic groups. Iran is not the only country that has had to deal with the problem of harmonizing different voices under the same roof. The good old U.S. of A. was faced with a similar problem when the Framers, like Thomas Jefferson, were designing their government and its constitution in the 1700’s. In order to ensure a powerful voice in the government, each state was to be represented by two Senators in the Congress, regardless of the size and population of the state. Needless to say, America has had to overcome many obstacles in its political evolution, one of which was the very same problem of harmonizing different tunes under the same roof. This was achieved only because their people, in time, came to agree that each tune had a right to be played and heard and it was guaranteed by the constitution. The keyword here is “time”, with a subtle emphasis on “education”. People in this region must understand that their future depends on each other and their astuteness in discovering their commonalities and investing in them wisely will only improve their lives and the lives of their future generations, whatever their ethnicity may be. Taking into account all the recent changes that have taken place in the Middle East both good and bad, an optimistic vision for its future may seem a mere dream. However, if the reader would bypass the bad publicity and the pessimistic view presented to the world through most media, then researches and discovers the positive developments, especially in the smaller Persian Gulf countries, I am certain a sparkle of hope will appear. Despite the chaos that is so clearly apparent in some parts of the region, order does exist in many areas but needs to be propagated to rest of the region. Considering the role of the Iranians in all this, I believe there are many opportunities for them to establish themselves in most of the neighboring countries where they can operate in a more civil environment yet remain close enough to maintain an interactive relationship with Iran. What is even more important is the fact that this will bring about an occasion for modern Iranians to become familiar with their neighbors, promote mutual understanding and growth, create a financial interdependence and thus secure the political future of all parties in the Middle East. In my opinion, political activists from the different countries in the region, especially those of Iranian descent, should spend less time on overthrowing their governments. And instead, spend more time on educating their people to overcome ignorance and tribalism and to promote active financial co-operation and cultural exchange with the different ethnic groups in the region. In this way, there may be hope for future generations to understand and internalize democracy and to naturally implement it themselves, as opposed to having it forcibly imported with unpredictable consequences. It would be unfair to deny the enormous effect that the recent developments in the Gulf countries, especially in the United Arab Emirates, has had on the people of the Middle East, with Iranians being among the top beneficiaries. The stability, modernity and the peace of mind provided by the Emirate of Dubai, has allowed many Iranians from Iran to experience a peaceful, orderly and respectable life, some for the first time in their lives. In addition, the possibility of higher education in reputable universities, job placement in international corporations, decent housing, proper medical system, fine entertainment of all kinds and most important of all personal freedom and dignity, a rare commodity in Iran, has created a prime location for many Iranians to seek permanent residence. While other Gulf countries are using UAE, and Dubai specifically, as a model to follow, Afghanistan and the Moslem ex-soviet republics are opening up as well and attempting to attract foreign investors. All of this is inadvertently placing much pressure on the more closed societies such as Iran who is losing citizens and potential business clients to its more stable and globally aware neighbors. In my opinion, any form of legal activity whereby progress is induced into any of the neighboring societies will have a direct adverse affect on the ailing system in Iran, while highlighting its weaknesses. Contrary to the pessimism that is reflected in the media there are plenty of opportunities for expatriates to bring forth their knowledge and financial power to rebuild many parts of this region. For those who are interested in rebuilding “ancient Persia” here is an example of an upcoming event in a “former” part of that empire. This will describe what those “soosmar khors” are up to these days. An example of what one local Iranian businessman in Dubai is doing quietly to support the Iranian youth is reflected in his company recruiting policy. Although he has access to a large pool of international technical skill, he opts to hire Iranians from Iran. The cost and efforts of acquiring work visa for an Iranian employee is many times higher than for an Indian employee. However, he feels responsible to carry out his part in promoting Iranian skill and to give back to his native land. There are many cultural and entertainment activities in the region that are proving to be successful in drawing Iranians and exposing them to a community that is economically healthy and globally conscious. This can only help to, at least, raise their standards of living and expectations of themselves and of their society. I believe that decisions and tangible social commitments which are based on long term vision and realism, as opposed to mindless and deafening rhetoric, will have deeper influence on today’s youth and tomorrows leaders. Moreover, the recent terrorist activities only reflect how desperate the region is for reform in thinking by its inhabitants. Developing a strong and healthy middle class in the region is the only way to nullify such shows of desperation and regain a sense of dignity and build a better life. Perhaps if the people of the Middle East would crawl out of their mental cocoon, discover themselves and each other, and see the bigger vision of the Middle East, they would be able to channel their energies in a more constructive fashion and help in building a more peaceful and prosperous environment for themselves and their future generations. Perhaps one day we will do to the Middle East what the Europeans did to Europe and become, UME, United Middle East.